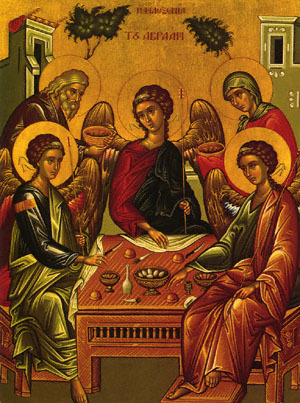 As it is the custom of the Church, on the day after every great Feast, to honour those through whom it came to pass our Lady on the day after the Lord's Nativity, Joachim and Anna after our Lady's Nativity, the holy Baptist the day after Theophany, and so forth, on this day we honour our God the All-holy Spirit, the Comforter promised by our Saviour to His disciples (John 14:16), Who descended upon them at holy Pentecost and guided them "into all truth" (ibid. 16:13), and through them, us. Share the feast of Monday of the Holy Spirit with an icon greeting ecard.